As sleeping is a necessary part of life, so when one gets used to a poor sleeping pattern, it may lead to critical issues like circadian rhythm sleep disorder. In the life of adolescents, it is necessary to take care of every habits and performances of them and in case, you find your children are leading to some sleeping issues, you should immediately take it in serious consideration. Your ignorance may affect your child’s future as well as present performance. Some people believe that teens do not require much sleep in a day, but it is not true; however with aging, their need of sleep gets increased. So, take care of such elements and help your teens in good teenage sleep. It is found that adolescents require a nightly sleep for 9 hours; however adults only sleep for 8 hours. This increase in teenage sleep needs is related to puberty period of adolescents. In this period, some physiological changes get occurred in adolescents. 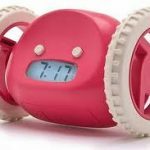 Usually, you have noticed that children start taking interest in sleeping for longer time as they grow and in this situation, the starting time of school gets earlier to them as they get mature. So, it can be said that puberty demands excess amount of sleep. It can cause some mental, physical or social consequences in adolescents that affect their school performance. 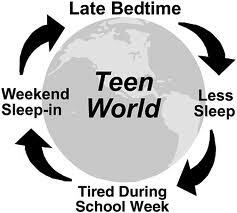 After conducted several surveys for teenage sleep, it is experimented that student with week sleeping schedule face issues in school achievements. It also decreases their alertness to studies or other tasks. 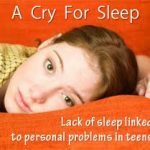 Moreover, the problem of delayed sleep phase syndrome in teenagers, when they cannot find proper sleep at night, it affects their daytime performance as they feel sleepy throughout the day. 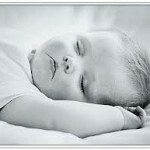 The study has also found that students, who take proper sleep in the night, obtain more scores in school performance. Therefore, teenage sleep contributes a lot in their academic performance. Knowing the importance of teenage sleep, parents should personally involve themselves in promoting healthy sleeping habits. In this regard, they should consider following mentioned suggestions which will help teens in sleep deprivation and will improve their school performance. Ask your teens to get short nap for around 30 minutes when they come back from school by setting an alarm clock. Help your teens for a particular regular bedtime. Help your teens to go to bed on specific time and to get up on right time. Your teens should be told the reason of their changing sleep needs. Let your teens to sleep longer in the morning on weekends. But remember that do not allow more than 3 hours sleep to them. The age of adolescence is very sensitive and thus, it requires special care and support of parents.